Dawn and John Carlson's farm is silhouetted through bike tires on Malta Rd. in Kirland during the Bike MS 33rd Annual Tour de Farms on Saturday, June 21, 2014. The Carlson Farm hosted the 13 mile rest stop for the ride which started and finished at the NIU Convocation Center, weaving around DeKalb County. 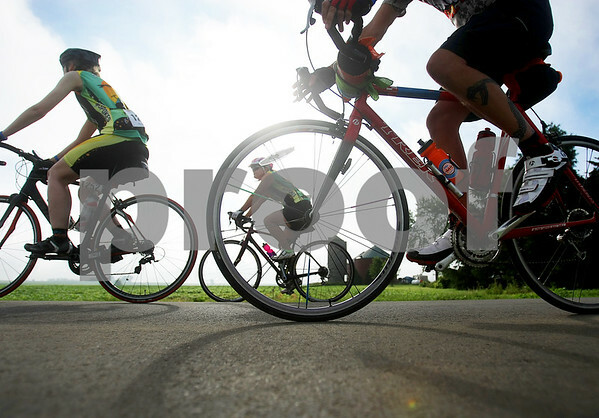 The Greater Illinois Chapter of Bike MS, offered two days of rides, ranging from 15-200 miles. Multiple sclerosis is an autoimmune disease that affects the brain, spinal cord, and a person's central nervous system.